to inspired living and joyful creativity. This course is based on simple lifestyle changes. Some of these are directly related to your creative work, but before we explore inspiration and expression, we focus on building a supportive base within your life. The Inner Temple : your self image and peace of mind. We don’t create in a vacuum. 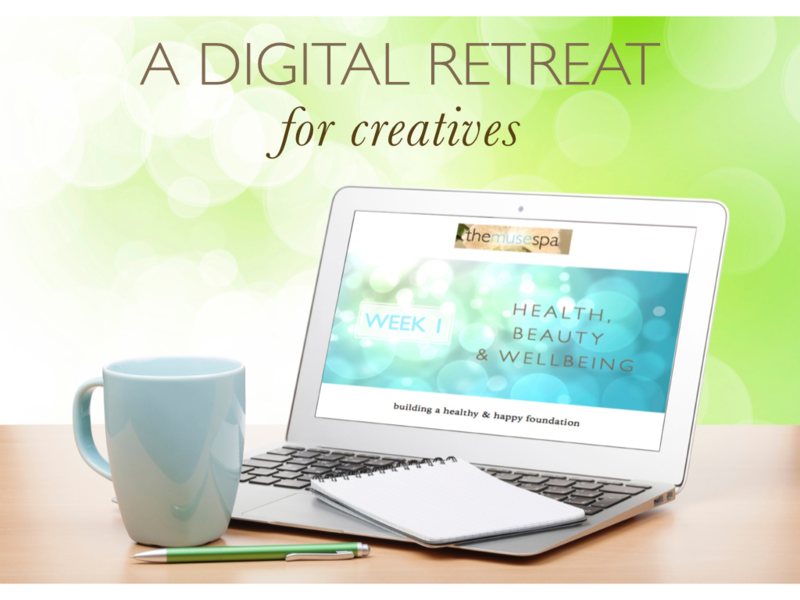 When we turn up at our creative work, we bring all our health issues, heartaches, moods and self-doubts with us. (That’s if they allow us to get that far in the first place.) These aspects of ourselves filter into our creative activity, they may even be evident in our creative output. The ‘rest of our life’ effects our work – both what we do and how we do it. So making small lifestyle changes is bound to effect our creativity in one way or another. But if we are intentional about those changes, and what the effects will be, we can craft a strong, healthful and inspired base from which to launch our creative dreams. The Muse Spa is, on the surface, a course about getting in touch with your muse and enjoying more creative ease and fulfilment. However, the techniques we’ll use to become more inspired also happen to have sublime benefits that touch every aspect of your life. And just as certain lifestyle changes can enhance your creative work, enjoying a healthy creative life can have positive effects that ripple across your whole life. Creativity is good for us. Expressing our creative energy has beneficial and far-reaching effects for mind, body and spirit. The benefits of an inspired and joyfully creative life include improvements to your physical health and appearance, your wellbeing, your relationships, your self-esteem, your peace of mind, even your life balance and your bank balance. For example, part of The Muse Spa process involves defining and refining your creative dreams. As a by-product of this work, you’ll develop more clarity about your core values, which will spark ideas about how to incorporate more of what really matters into your life. This is a recipe for more happiness and fulfillment, which also happens to be good for your health. Another technique aims to streamline your schedule, enabling you to devote more of your time to joyfully expressing your creative self. A happy side-effect of this is reduced stress and the attendant benefits for your health, vitality and enjoyment of life. And the ultimate aim of this course – creative bliss – naturally inspires a lighter approach to life, increasing your sense of playfulness and fun, traits which result in a more peaceful core and balanced sense of self. Positive changes in your creative life filter through to your life beyond your work – and vice versa. This is why we address your entire lifestyle. It’s also why the course structure is so flexible, why it’s no big deal if you skip any tasks. You could simply cherry-pick whatever feels the most fun and still enjoy positive shifts. Any positive changes from any section will have a beneficial ripple effect – enhancing your creative life and your world beyond. The Muse Spa techniques are designed to spark a process of inspired creativity with beneficial side-effects – benefits which themselves lead to further positive results. Welcome to the magic of the Upward Spiral. The Upward Spiral is an expanding flow of positive changes and their cohesive effects. Your work and the life beyond your work are two aspects of one whole – you. In The Muse Spa, we enhance both these facets, simultaneously, in a such a way that each improvement supports and is supported by the other changes. It’s like a double helix of enhancement, each strand feeding and being fed by the other, spiralling onwards and upwards to creative bliss. Small, positive changes in one area filter through to other aspects of your life and work their magic across the whole – which changes you, inspires you in new directions, propels you closer to your aims and dreams. Positive change – however slight – is motivating, energising, inspiring – and this is where the magic kicks in: the benefits create their own positive results. The side-effects begin to empower you and inspire you to create even more positive change in your life. For example, increased self care leads to increased wellbeing, beauty and health. These results lead to more confidence and increased inspiration – which together result in more time and creativity, more clarity and expression. All this enhances your productivity and success, with by-products of higher self-esteem and increased generosity – for yourself as well as others. And this new sense of compassion feeds back into the cycle of improved self care. And on and on… ad infinitum, spiraling upwards in a joyful journey of growth and wellbeing and your greatest work. And just as the way to get happy is to be happy, the benefits of being more inspired are also the tools to becoming more inspired – and vice versa. The by-products of a joyful creative life are also the route to further success and enhanced results. The perks of the process – health, inner calm, connection – are also the route to more of it. In leaning into this system of small shifts and improvements, you enter the flow of this upward spiral – this holistic, integrated, virtuous cycle. Success breeds success. Joy begets joy. Creativity boosts wellbeing, health, wealth, balance and personal happiness – all of which enhance inspiration, creativity and success. The more inspired you become, the more you experience ease and confidence, which are forerunners to success – a success which frees you to focus on what you love, which will lead to ever more inspiration. This is the core philosophy of The Muse Spa: Carefully designed treatments and benefits that combine powerfully to help you naturally, effortlessly connect to your muse, unleashing a vibrant life energy that sets your creative world on fire. In addition to the core content of The Muse Spa, membership also includes a powerful support service: The Muse Prompts. This is a sequence of short emails, designed to reconnect you to your creative spirit. The Muse Prompts are brief but regular missives on behalf of your muse, intended to spark new perspectives, ideas and activities. These frequent nudges may be short and very sweet, but they harness the power of repetition – the language of your subconscious mind. They are designed to complement and develop the main Muse Spa techniques, as well as trigger new thought patterns and habits to enhance your creative life. 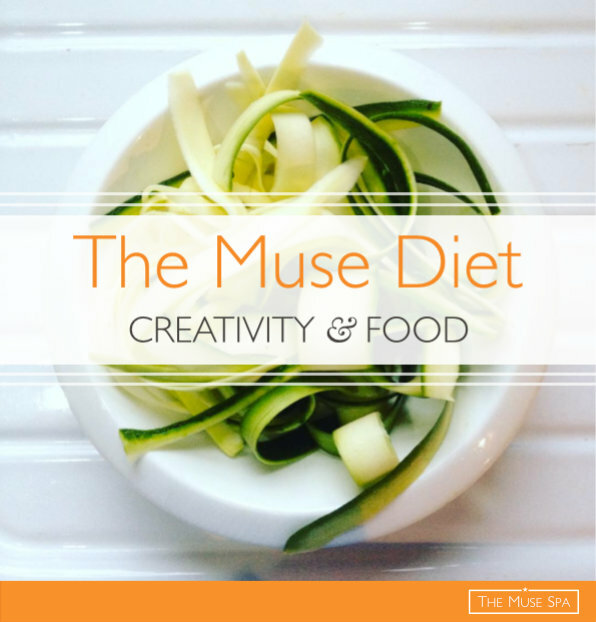 The Muse Prompts also incorporate an often neglected channel of creative inspiration: fun! Like a paper trail from your muse, these lighthearted hints, games and invitations will reconnect you to the joy and excitement of your creative spirit, rekindling the spark that first drew you to the creative life. This element of the course is pure playfulness and pleasure – the serious business of fun. At least, it’s only revealed within The Muse Spa. So, you’ll find out all about this powerful component in the Pre Spa Guide included in your Welcome Pack. This ingredient, which may appear to be just a welcome bonus, actually plays an important role in the process. It will make you more likely and able to implement positive changes in your life, especially those changes you’ve been meaning to make but haven’t yet found the right motivation. Is time to discover your muse? 6 steps to rediscovering your creative spirit.